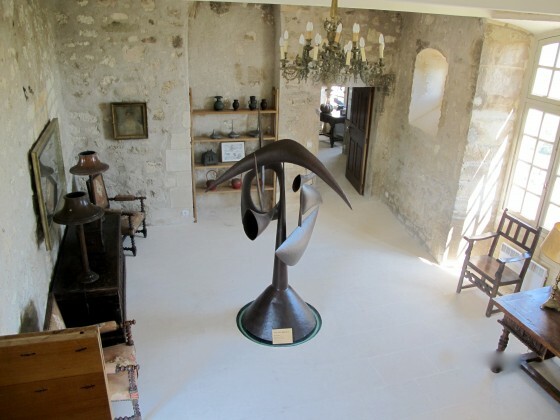 A pasha of fashion, Pierre Cardin has taken up renaissance-pomo things like buying decrepit Châteaux and renovating them, the primary object of this particular enterprise is the Château Lacoste, once the lair of the Marquis de Sade. 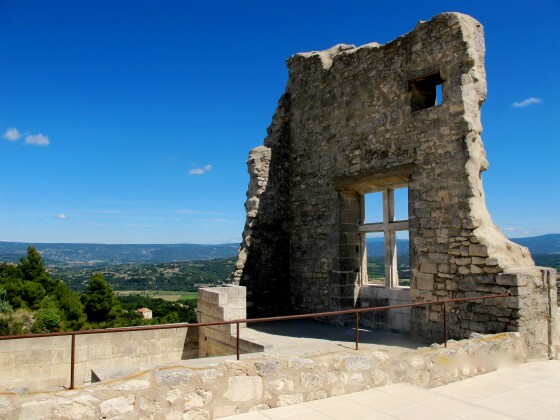 The château was ransacked twice by villagers who even removed large stones for building their houses on the slopes below. 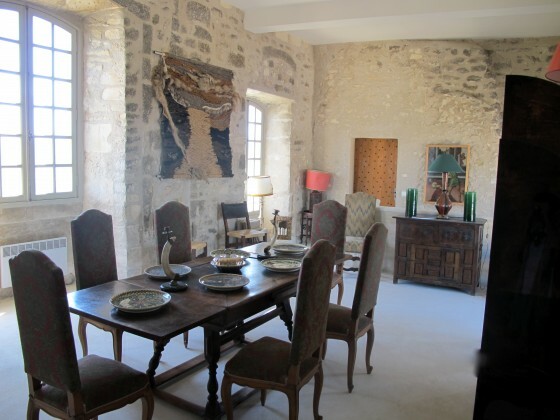 Andre Bouer, a professor in nearby Apt, bought the château in 1952, firmly intent on its renovation, yet the price tag exceeded his modest means. When Pierre Cardin first inspected the property, shown by the late professor’s wife, on a rainy dreary day, he left unmoved to buy. Upon a second visit to the château, the azure sky, fresh spring air, and the sweeping view of the valley grabbed him with emotion. A deal was cut in 2001. Cardin desired to keep the château as it appeared from a distance with its craggy silhouette. 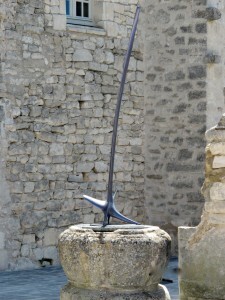 One enters the château via a drawbridge that leads to a courtyard, which hosts a few events of the Lacoste Festival. 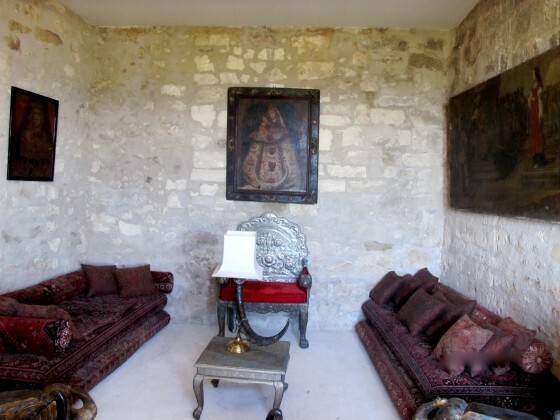 Within the the top floors, which are now is open to public, Cardin has restored the walls, floors and ceilings of the rooms and decorated them with furniture and artifacts. Below the top floors and off limits to public view, Cardin constructed a living area of several bedrooms, a dining room, library and a living room. Peach is the predominant color. 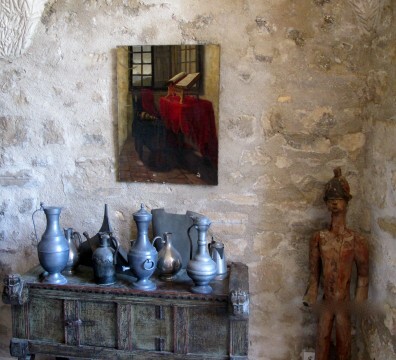 Artifacts of Cardin’s exquisite passion for antiques, furniture and art abound: a Rodin sculpture, a Buddha, Oriental couches, 17th and 18th century chairs, mirrors, and paintings. Below the main floor, stairs descend to a guard’s room carved out of the rock. 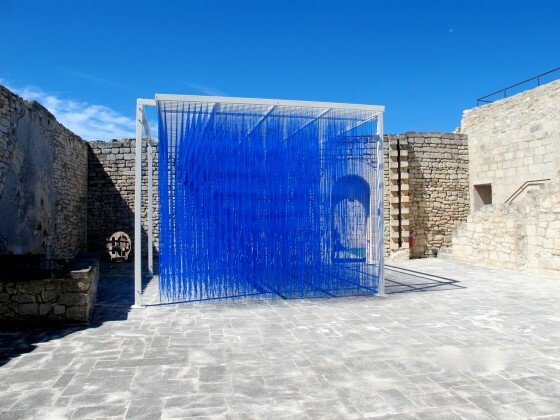 A passionate collector of art, Pierre Cardin is displaying the works of several artists in the courtyard: Yaacov Agam, Carlos Cruz-Diez, Philippe Hiquily, Nicolas Schoffer, and Jesus-Rafael Soto. 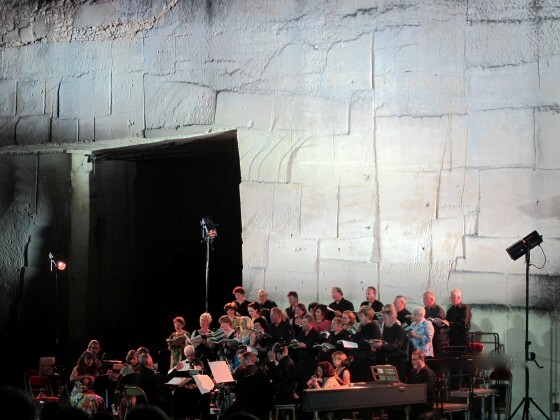 Saturday evening, the Lacoste Festival offered its last performance of the season: The Fairy Queen, an opera composed by Henry Purcell in 1692, was performed in the Old Quarry of Lacoste by the Deller Academy, six soloists and a choir of thirty, under the direction of Mark Deller. A grand merci to Pierre Cardin for another season of bracing cultural tonic to invigorate the senses. 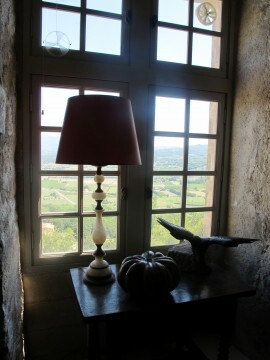 Lacoste Château: Enter village and follow signs to the top of the hill. 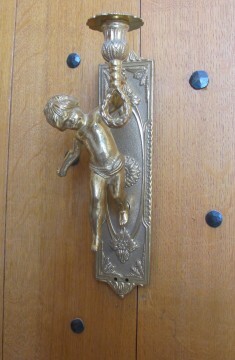 Open every day. 7 euros admission. Parking available at no charge. Information, memorabilia, delicacies from Maxims of Paris and postcards available at the Espace La Costa in Lacoste in the center of the village on Rue Basse. This entry was posted in Culture and tagged Lacoste, Pierre Cardin. Bookmark the permalink.